Nine months ago to the day, I was sitting exactly where I am now, penning a nearly identical article. While writers don’t choose their own headlines, I was 100 percent on board with the title chosen for the piece: The Los Angeles Chargers are going to be the NFL’s breakout team in the AFC. This time around though, I imagine the headline is going to be a tad different. The ultimate conclusion of my previous work was that the Chargers should be the favorites to win the AFC West. This time around, you can drop the ‘West’ altogether. This is a Super Bowl caliber roster that’s one healthy season away from fulfilling that potential. Pegged as one of our teams who could surprise with a Wild Card appearance later this season, the Chargers are more than that. We could go through their entire roster and assess their strengths and weaknesses, but that wouldn’t necessarily get you to why this year is going to be different from the rest of their recent history. The first thing to understand is that this was already one of the best defenses in the NFL in 2017. They finished third in team pass-rushing grade and second in coverage grade. 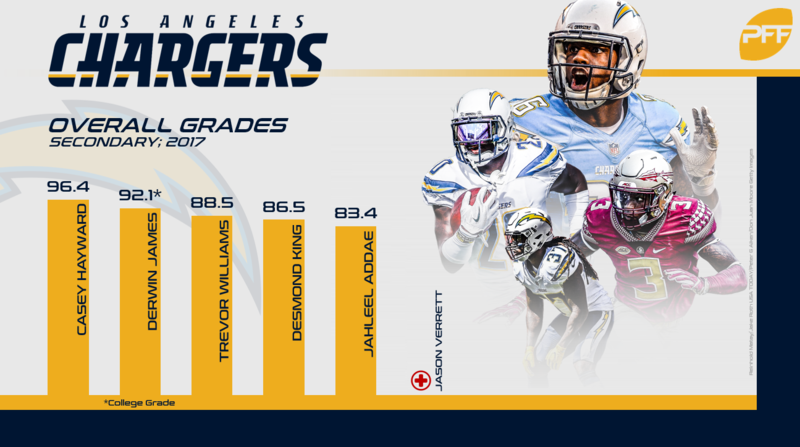 At this point of their careers, everyone knows about Melvin Ingram and Joey Bosa – PFF’s sixth- and seventh-highest graded edge rushers last season, respectively. However, not many know that the Chargers secondary was one of the deepest in the NFL. Casey Hayward was obviously the star of the unit and finished as PFF’s highest graded cornerback last season with a 96.4 overall grade – all while routinely shadowing opposing teams No. 1 receivers. His 19 combined pass breakups and interceptions were the second-most in the NFL. What people might not realize though, is that second-year corner Trevor Williams earned an 88.5 overall grade while rookie Desmond King checked in at 86.5. If former first-rounder Jason Verrett can get back healthy to his 2016 form that saw him earn an 89.4 overall grade, the Chargers will have the deepest cornerback room in the entire NFL. The slot defender is incredibly and increasingly important in today’s NFL and the nickel and dime linebackers on almost every team combine for well over 1,000 snaps each year. The combination of a deadly pass-rush and a secondary bereft of weak spots is a nightmare for opposing quarterbacks. That’s especially true in Gus Bradley’s Cover-3 defense that allows his defenders to play incredibly fast because they’re executing the same role play after play. Last season, the Chargers ran Cover-3 on 55.6 percent of their passing snaps a season ago, the highest rate in the NFL. Don’t expect that to change now with the addition of safety Derwin James. The Florida State product was the sixth-highest graded Power-5 safety in run defense and highest graded in coverage a season ago. The man was born to play the box safety role in Bradley’s defense. James was the No. 5 player on PFF’s Big Board, and the type of talent that could step in and play at a Pro Bowl level from Day 1. It could even be a better defense than the one that allowed all of 17.0 points per game a season ago. The real improvement in 2018 has to come on the other side of the ball though, as the main reasons they only went 9-7 lie on offense. Most egregiously along the offensive line. The Chargers line was and has been terrible. There’s no sugar coating it. Despite giving up the fewest sacks in the NFL (a very quarterback driven stat), the Chargers ranked 25th in pass-blocking and 27th in run-blocking. In fact, the Chargers haven’t had an above average pass-blocking offensive line since 2007. That’s a whole decade of ineptitude. There’s good reason to believe though that for the first time since that ’07 season that things could turn around. They signed center Mike Pouncey who, while overpaid for how he’s graded of late, was still a massive upgrade as PFF’s 14th–highest graded pass-blocking center last year. 2017 second-rounder Forrest Lamp returns to fill one of the guard positions as well. We saw him as a first-round talent and the highest guard on our draft board last year. Those two fill positions where the Chargers were a nightmare in 2017. Spencer Pulley was our third-lowest graded center while Kenny Wiggins was our ninth-lowest graded guard. 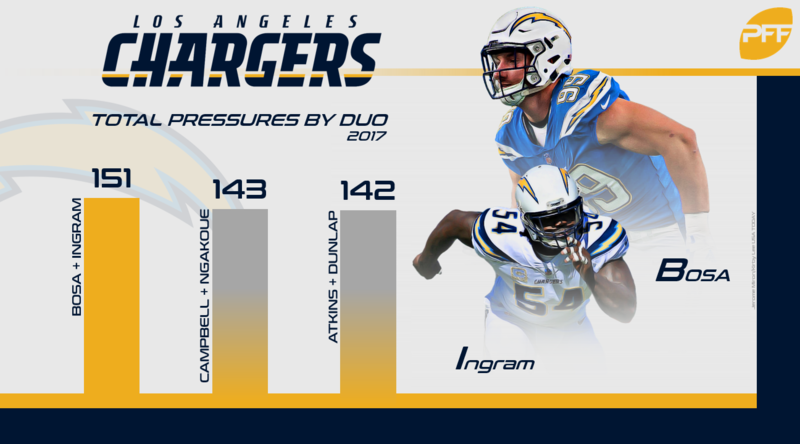 Even getting average play at either position will prove impactful for the Chargers in 2018. In the end though, it all comes down to health. Even the most talented teams in the NFL can’t survive injuries at key positions. For all the high-level talent scattered around the Chargers roster, they lack quality depth at a number of positions. Not much personifies that more than their first two draft picks from 2017 – WR Mike Williams and Lamp – playing a grand total of 234 snaps between them last year while both units underperformed. Even while writing this, breakout tight end Hunter Henry tore his ACL and will be out for the season. They simply can’t afford many more if they’re going to fulfill their potential in 2018. A full-strength Chargers team can go toe-to-toe with the AFC’s best, and at the end of the day they should be the favorite to come out on top.